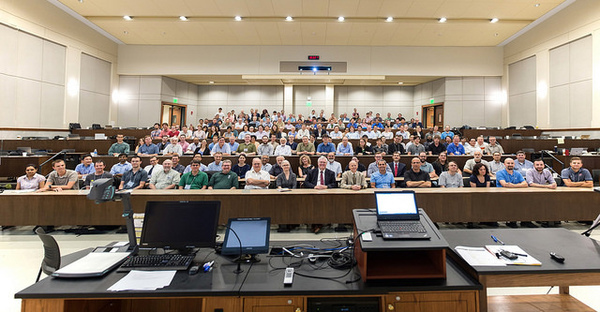 The Notre Dame event included seven pre-meeting workshops on nuclear data, tracking detectors, ARUNA, ARUNA spectrographs, DAQ, SECAR, AGFA, and AIRIS, and 12 working group sessions as well as plenary talks on such topics as U.S facilities, education, and funding agencies. The meeting produced a list of priorities beginning with FRIB, which is expected to begin operation in two or three years. In addition to Brodeur, the organizing committee was comprised of Ani Aprahamian of Notre Dame, Baha Balantekin of the University of Wisconsin, Alexandra Gade of Michigan State, Paul Fallon of the Lawrence Berkeley National Laboratory, Krzysztof Rykaczewski of the Oak Ridge National Laboratory, Hendrik Schatz of Michigan State and JINA, Michael Thoennessen of FRIB, Alan Wuosmaa of the University of Connecticut, and Sherry Yennello of Texas A&M.